I know that some teams like having a little fun at the expense of their opponents through social media, arena songs, and Jumbotron messages, and the Dallas Stars are starting to emerge as some of the finest in the business. They use the Jumbotron to poke a little fun at opposing teams, fans dressed in non-Stars uniforms, and anything else that catches the attention of the staff. Last night, though, they took a few shots at Winnipeg before the Dallas Stars fell 5-2 to the Jets. Apparently, the staff working for the Stars have no idea how to use Google or have never spoken to Winnipeggers Cody Eakin or Ryan Garbutt, both of whom play for the Stars. I mean, the Royal Winnipeg Ballet and the Western Canadian Aviation Museum are nice, but the rest of the list? Laughable. I may have a slight advantage over the Dallas Stars' staff in that I've actually been to Dallas. I can suggest a few places that I enjoyed, so we'll start with those places. Hey, if the Jets can hammer the Stars when they roll into Dallas like they did last night, it will make for a fun evening. Just note that the arena seats are a little tight according to TripAdvisor reviews, and the food and souvenirs are reportedly overpriced. One reviewer named reynoir2 from Kelowna, BC thought the $20 cost for a puck was a little much. I'd agree. I happened to really like the Dallas Zoo when I visited. The African area known as the Giants of the Savannah is amazing with respect to the space and animals featured, and it has won awards for its design. I wonder if the Dallas Stars know Winnipeg has a zoo? One that has a newly-renovated, state-of-the-art polar bear exhibit? Probably not. I'll admit I'm a sucker for aquariums because we don't have one in Winnipeg. However, the Dallas World Aquarium is incredible thanks to the variety of fish, bird, reptile, and mammal species they have at the aquarium. It was a little short in terms of the walk-through, but the animal enthusiast in me loved the featured creatures. We have a few pet stores with aquariums. Does that count? Um, I appreciate gardens and stuff, but this is what everyone who visits Dallas should see? The Dallas Arboretum and Botanical Gardens sound like it's a fantastic place to visit. If you enjoy watching grass and other plants grow. Hey, we have a big park with an English Garden! Mmmhmm. I know it's a historical site, but the The Sixth Floor Museum/Texas School Book Depository kind of gave me a creepy feeling. I appreciate the significance of the museum/depository, but it feels wrong to celebrate the death of another. There are a ton of facts and information in the museum, so if you are a John F. Kennedy fan, this would be a good place to learn a great deal of information. We never had a head of state assassinated in our fair city as far as I know, so that's uniquely Dallas. Winnipeggers are known to like their Slurpees. Well, it's time to expand that palette by introducing your taste buds to a frozen margarita. The frozen margarita machine was invented in Dallas in 1971, and you would be wise to know that Mariano Martinez was a 26 year-old restauranteur whose restaurant was failing when it was a stop at 7-Eleven that changed his life. "I had a sleepless night and the next day, I stopped to get a cup of coffee at a 7-Eleven and I saw that Slurpee machine," Martinez told Matthew Huisman of The Dallas Morning News. "The entire concept hit me at one time." Slurpees, a frozen margarita machine based on Slurpees, and Winnipeggers. It seems almost too perfect, no? Thanks, Dallas. We'll help you sell a few hundred thousand more, if you don't mind. I was in Dallas in mid-September. It was well over 100°F. I was literally sweating my tail off, and everyone kept telling me how cold it was. Seriously. One nice, young woman who worked at the Dallas Zoo told me that she couldn't believe how long the cold snap was lasting. SERIOUSLY. Apparently, if it's not 3000°F, it's parka weather in Dallas. Wussies. It's only fair that if the Stars push the Western Canadian Aviation Museum, I should push the Dallas aviation museum, right? The Frontiers of Flight Museum "memorializes the pioneers of flight, from the 1920s and 30s, through World War II and up to the jet and rocket age of today. The museum also showcases the Dallas/Fort Worth area, known today as the Aviation Capital of the World, played in aviation history." Yay, planes in both cities! You got one. We got one. Neither of us really like them. Wait, it almost seems like we have a number of similarities here, Dallas! We live in the same time zone, we play in the same NHL division, and we both got our teams through relocating a pre-existing team! 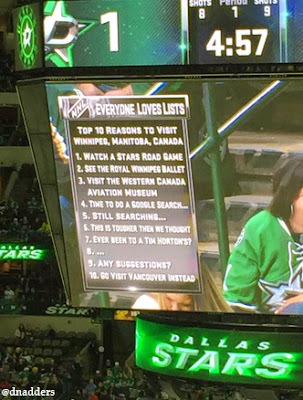 Our cities are pretty similar, right down to the scary crime statistics, so why do you treat us so, Dallas Stars? Why can't we be friends? Your move, Stars. Puck is in your net. Five times, by my count! ZING!